Often when comparing Android(s goog) and iOS(s aapl), folks will point out that Android phones are more customizable. They don’t just mean with wallpapers and such, however. Users and apps can take finer control of the phone’s settings or read sensors to fire off events. Call it “smart customization” if you will. Apps such as Locale and Tasker are prime examples, but they can be overwhelming to use at first. Atooma is a new beta app in Google Play that I think nearly any Android device owner can use it for the same customization and control in a few short minutes. The interface to do this in Atooma is extremely intuitive. Starting with a few colored dots that represent different conditions, customize the events and then select actions in a circular user interface. It’s almost like dialing up short automaton script with an old rotary phone. How does it work? So far, quite well for me. I created some simple scripts myself, but you can see other scripts that fellow Atooma users have created. 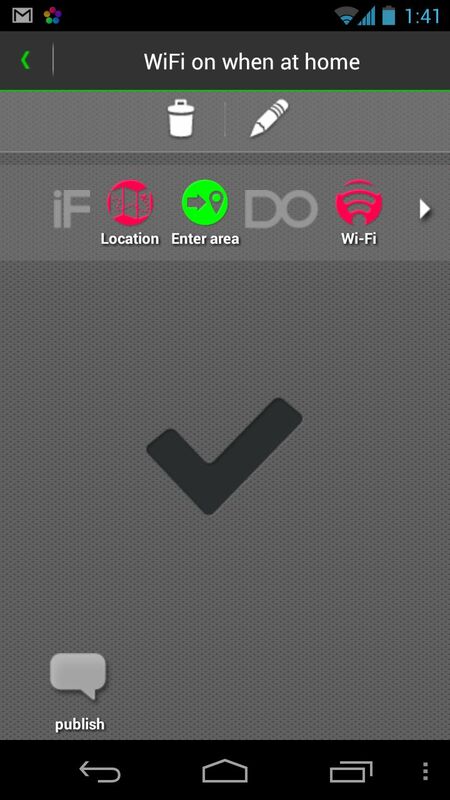 I found one to “turn Wi-Fi off when leaving home”, which I downloaded. All I needed to do was change the event location to my house — which was simple using a maps interface — and that was it. To test it, I walked about 200 meters down the street and just like that, my Wi-Fi radio automatically shut down. I already had a script to turn it on when arriving home and Atooma did just that when I returned from the walk. That’s just a simple — but useful — example, of course. You can fire off events if a file is downloaded or deleted (handy for an automatic upload to Dropbox), for example, take action upon incoming texts, emails or calls, or automatically send a tweet or Facebook (s fb) message in a particular event. Similar the Wi-Fi rule, I’ve already set up Atooma to turn on my Bluetooth radio when I leave home. I seem to forget to do so when going out for a drive; I’d rather use a Bluetooth headset in the car. And I noticed another user set up a rule to read incoming text messages aloud when the GPS radio detected he was traveling faster than a certain speed and presumably driving. 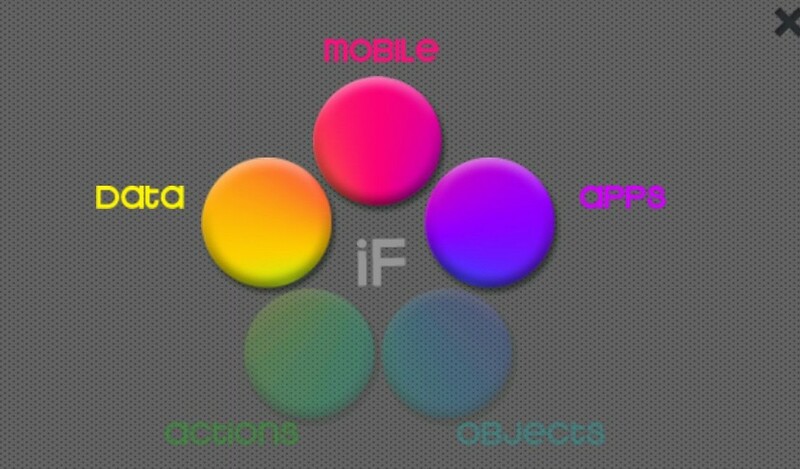 Essentially, user actions are only limited by what events and hardware Atooma supports and your imagination. Going to have to try this out. But with the name of this product, I keep thinking of that line in “Kindergarten Cop” with Arnold Schwarzenegger… “It is not a tooma!” LOL! Seriously, going to download it now and give it a try this week! Thanks for the heads-up! This is a nice app, has great potential. I’m currently using a similar tool called MacroDroid which is really easy to use. It also has an option to remove the taskbar icon (it does warn that some issues may arise but I’ve not had any problems). If you are looking for an easy to use application to automate everyday actions such as a “battery-saver,” try Atooma. The cool thing is, other users save their profiles for you to use on your phone. So, “WIFI on at home” is a Atooma profile you can use on your phone. This seems like an interesting app. However, it requires sign-in to a Google account and permissions to access your email address and account information. There is no acceptable reason for requiring access to this kind of user information. easy to use but didn’t work at all with location triggers. Well, that was a quick install and un-install. I was a bit nervous with the number of permissions the app requires (e.g., full access to your contacts), but then it requires you to sign into your Google Account to move past the opening screen. No thank you. I liked the idea and most of the engine they’ve placed in the product. My main problem is with the terrible icon they force on my task bar. It was the single reason why I decided to ditch this app after an hour of use. My taskbar is too clutterred as it is – I just didn’t see a reason for such an app/service to take space there. Are you getting the Jelly Bean update? If I understand it correctly, this will allow you to controll what apps do with the task bar. This is the first thing I’ll test when I finally get my update. Tried using the “Switch WiFi when at home” atooma but it cannot find my house in Mumbai, india when I search for it. That’s weird because if you type my area name “Yogi nagar, Borivali, Mumbai” in Google maps it does show. Also, I tried to manually drop a pin on my house, but still it keeps saying “Found nothing, retry!”. It just keeps giving that same error to any nearing location I choose. How’s its effect on battery life so far? Great work to the Atooma team for making it more accessible! @Kevin Tofel – is this more or less flexible than LLAMA app? I am a beta user of their software, (I own a Toshiba Thrive 16 GB 10 inch tablet that had Honeycomb, and now has Ice Cream Sandwich) and I have it set so that (at least for now) it sounds a urgent alarm when my battery falls between 25 & 15%, and after I plug my tablet in, I walk away. As far as the battery charge, I have it set to sound a pleasant chime when it’s finished charging. I might make plans to set it so that if the battery is low, it turns Wi-Fi access off. If my tablet becomes fully charged, I’ll have it set so that Wi-Fi access turns on. Nice usage, Nathan! The more I play with this app, the more I like it. Kevin, I’ve been wanting an app to do that (control the various radios based on location) for a while. But does it require that GPS stays on all the time? That consumes too much battery. I was thinking that it could use the accelerometers to sense high speed movement, and then turn on GPS or wi-fi to establish the location and set the radios accordingly, but I don’t get the impression it goes to that trouble. I don’t know if that will work. If you are traveling at constant speed, you are not accelerating . . . your phone will think it is standing still. For now GPS is only option. Location does not require GPS necessarily, it’s suppose to trigger your position from wifi and 3g cells too. By the way we are strongly improving location accuracy without Gps at all. Great, I’m going to try it out. But how are you going to make money? I see that it is free, is that only for beta users? kenica. Great time to upgrade to a Motorola Razr MAXX. My MAXX battery goes 24 hours heavy use…day in, day out. Seeing how Mot has backtracked on its promise to upgrade the Photon 4G to 4.x, I won’t be buying any more MOT phones, even if they are owned by google. Unless google starts putting stock android on all of Mot’s phones. Which is unlikely.